This richly detailed study chronicles recent political events in southern Mexico, up to and including the July 2000 election of Vicente Fox. Lynn Stephen focuses on the meaning that Emiliano Zapata, the great symbol of land reform and human rights, has had and now has for rural Mexicans. Stephen documents the rise of the Zapatista rebellion in Chiapas and shows how this rebellion was understood in other parts of Mexico, particularly in Oaxaca, giving a vivid sense of rural life in southern Mexico. 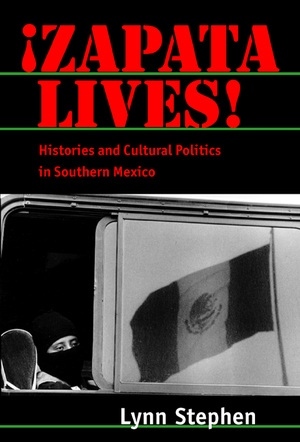 Illuminating the cultural dimensions of these political events, she shows how indigenous Mexicans and others fashioned their own responses to neoliberal economic policy, which ended land reform, encouraged privatization, and has resulted in increasing socioeconomic stratification in Mexico. Mixing original ethnographic material drawn from years of fieldwork in Mexico with historical material from a variety of sources, Stephen shows how activists have appropriated symbols of the revolution to build the contemporary political movement. Her wide-ranging narrative touches on the history of land tenure, racism, gender issues in the Zapatista movement, local political culture, the Zapatista uprising of the 1990s and its aftermath, and more. A significant addition to our knowledge of social change in contemporary Mexico, Zapata Lives! also offers readers a model for engaged, activist anthropology. Lynn Stephen is Professor of Anthropology at the University of Oregon. She is author of Women and Social Movements in Latin America: Power from Below (1997) and Zapotec Women (1991), among other books.